Cooking for me is an ever evolving and growing process. Like with most everything one learns to do, practice makes better (as a musician I never prescribed to practice makes perfect). This thai sweet potato is a great example of what I mean. It started as a simple sweet potato salad from a few years ago that needed updating. The original recipe was fine, but it lacked balanced flavors. The end result of the revamp is this hearty and cohesive Thai sweet potato salad. Excellent packed for lunch or as a side to dinner! 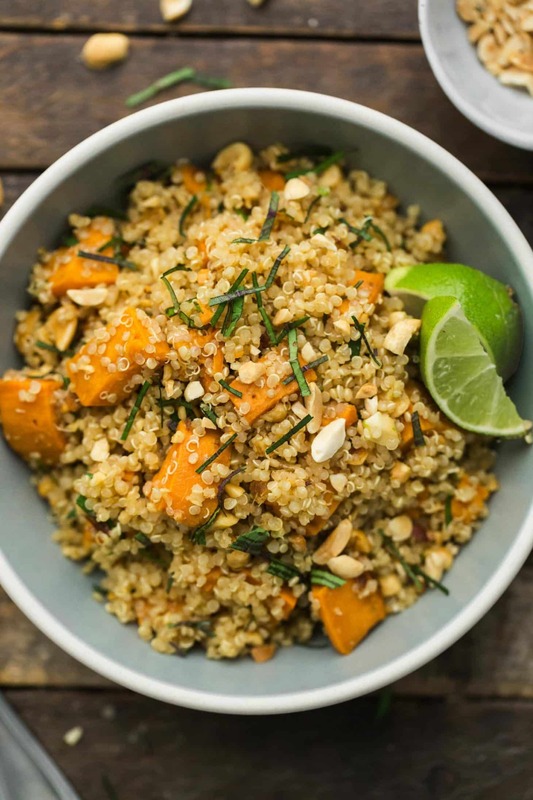 A perfect fall salad with a twist, this sweet potato salad uses quinoa for bulk and a simple lime dressing for flavor. Peel and dice sweet potatoes into 1/2 inch cubes. Transfer to a baking sheet lined with parchment paper. Toss sweet potatoes with garlic, ginger, coconut oil, and cumin until well coated. Roast for 20 minutes or until sweet potatoes are tender and beginning to brown. While the sweet potatoes are in the oven, rinse quinoa and place in a pot with the water. Bring to a boil, reduce to a simmer, cover, and let cook for 15 minutes. Once cooked, let rest 10 minutes off heat. In a small bowl, whisk together lime juice, peanut oil, grated ginger and soy sauce. Thinly slice basil and set aside. 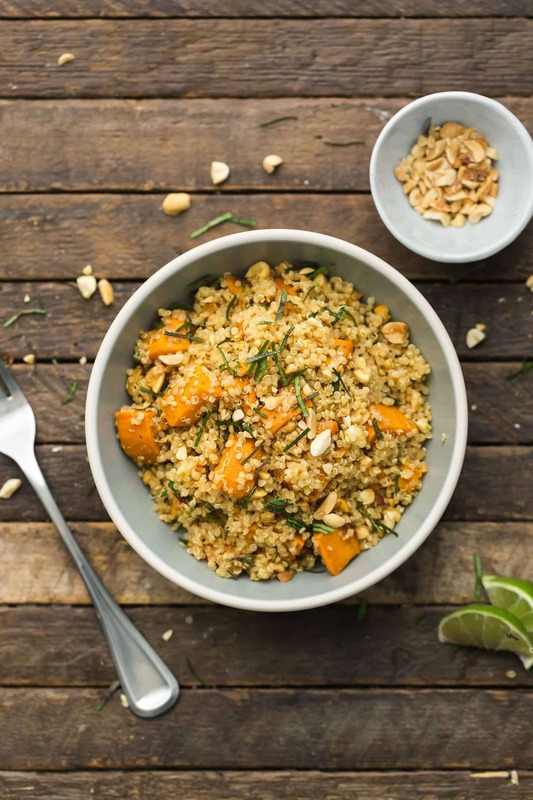 Combine sweet potatoes and cooked quinoa in a large bowl. Pour dressing over ingredients and add basil, peanuts, and lime zest. Toss together to combine. Serve with a sprinkle of cilantro and salt and pepper to taste. Tips & Tricks: Letting the quinoa rest after cooking will help you achieve fluffy quinoa instead of sticky quinoa. Roasting the sweet potatoes really highlights the sweetness and adds a great caramelized texture to the vegetable. Root Vegetables: Swap out the sweet potato for another root vegetable like parsnips or carrots. Grains: You could make this dish with any leftover grain. 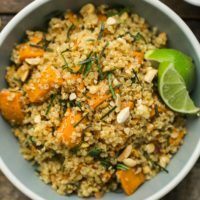 Try it with brown rice or freekeh. Herbs: Can’t find thai basil? Italian basil or lemon basil would be a good swap. Or add extra cilantro and ginger! 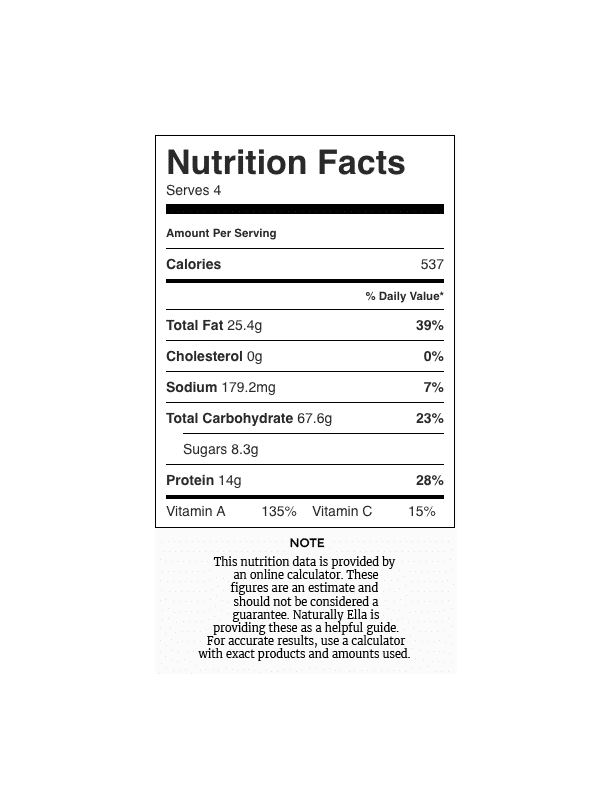 Sweet potatoes will always remain one of my favorite vegetables, primarily for the ease of use and how well they work in a plethora of recipes. 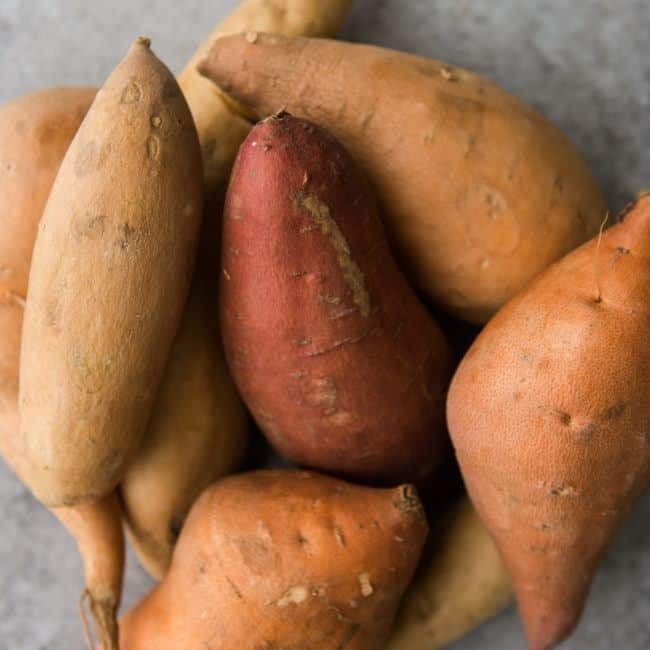 The below three recipes are just the beginning of my sweet potato recipes but a good sampling of my favorites. I just made this for dinner and it is delicious! Will definitely become one of my go-to recipes as it is quick, easy, and good. Thanks for sharing. Omg, wow! I so need this in my life! I do- I think it would be perfect! I made this tonight in Portland, Maine for my husband and myself and it was out of this world! Great texture. Fabulous taste. Five stars! I’ve always love sweet potatoes ever since I was a child, as well as my siblings. I love it with coconut milk and this recipe is just what I was looking for. keep posting! I made this tonight and it was delicious. The combination of sweet potato, lime and fresh herbs makes the dish. I used regular basil and wouldn’t hesitate to do so again. I served with curried lentils with coconut milk from Julia Turshen’s new cookbook, Small Victories (recipe on food52). Thank you for a delicious meal! Will definitely repeat this! Was great as leftovers for lunches during the week!